Summary : This green tea tastes pretty good at first sip, but has a rather nasty and bitter after-taste. Definitely does not compare to Tazo's China Tips Green Tea or Tazo's Zen Green Tea. Review : After experiencing two excellent green teas from Tazo, I was in a "happy mood" when I went to taste the decaffeinated version of Tazo's green tea, called Lotus. I don't worry about my caffeine intake since I despite coffee and have a fairly limited soda consumption. Still, less caffeine is good, especially before bedtime. So my experience with this tea occurred at 3am, right before crawling off to bed. Tazo's Lotus Green Tea contains the following ingredients : Naturally decaffeinated green tea leaves, natural lotus flower flavor and other natural flavors. This is what Tazo has to say about this tea : "A delightfully subtle green tea with the inner radiance and essence of lotus flower." Pretty lofty words for a green tea, I thougt. Still, Tazo's other green teas are darn good, so who knows, maybe the advertising tells the truth? Additionally, I thought I really would like this tea, I really did. Why? Well, the scent of the tea just smelled light, airy and pleasant right out of the foil bag. In short, it smelled like other Tazo's green teas - all of which I've liked. Yet, I was to be disappointed. Initially, I thought I liked this tea. After the first sip, the taste was indeed light, and even somewhat refreshing. But then, oh, ouch, the nasty after-taste kicked in. It was bitter, nasty and just plain bad. And no, it wasn't due to me overbrewing it - I let the tea brew for 3.5 minutes, right in-between the recommended 3-4 minute brewing time. One oddity I noticed about the after-taste of this tea is that the longer the flavor lingered on your tongue, the stronger and more potent it was. I thought this was rather strange. Usually after-tastes hit hard immediately after sipping then gradually fade away, depending on the strength of the tea. What this means is that if you really want to drink this tea to avoid the caffeine found in green tea - which isn't that much really so why bother - you will want to gulp down this tea, not giving the bitter bite of the after-taste a chance to set in. By gulping down the tea, you'll only have to endure the nasty and peculiar after-taste of this tea once. In short, don't be stupid like me, taking a sip, putting down the tea for 30 seconds, then taking another sip, then putting down the tea, and repeating the process until the tea is gone. Doing so is a good way to torture yourself, although I guess if you enjoy pain and self-torture, then perhaps this tea is indeed for you. Recommendation : No. The tea tastes good when drinking it (which is why I give it two stars instead of one), but the tea exacts its revenge on the person who drinks this about 30 seconds later in the form of a bitter and rather nasty after-taste that only gets stronger as time passes by. Yeah, it doesn't have caffeine. But who cares. 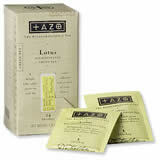 For a good green tea, try some of the other Tazo teas, in particular, Tazo's Zen Green Tea. Brewing Instructions : Pour 1 cup boiling water over tea bag. Let brew 3-4 minutes. Note, when brewing most green teas, you do NOT use boiling water. But, the instructions were clear on the box - use boiling water. So I did. I suspect the use of boiling water for this particular green tea is due to the spearmint leaves (spearmint leaves are usually found in herbal teas and require boiling water to bring out the full flavor). Also note, do NOT overbrew - otherwise a bitter taste awaits your future. I went 3.5 minutes and it was the perfect brewing time.